Butte County Sheriff Kory Honea will provide the keynote address at the 17th annual Colusa Farm Show Rabobank Breakfast. The breakfast will take place on Wednesday, Feb. 6, 2019, in Saint Bernadette’s Hall, 745 Ware St., in Colusa, California, beginning at 7 a.m.
At the 2018 breakfast, Butte County Sheriff Kory Honea provided an inspiring keynote address about his experiences managing the public safety response to the Oroville Dam spillway incident. 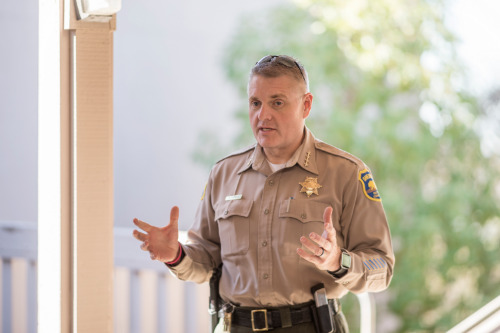 His leadership, compassion, and grit has been on national display throughout the devastation and aftermath of the destructive Camp Fire, and Sheriff Honea has agreed to share his experiences once again. Roland Fumasi, senior vice president and agricultural economist for Rabobank’s RaboResearch division, will provide an update on the economic outlook of agriculture in the coming year. Fumasi and his team analyze and conduct market research on California agribusiness as well as the North American fresh fruit and produce sectors. Hosted by alumni of the California State University, Chico College of Agriculture, California Agricultural Leadership Foundation, and Alpha Gamma Rho, the event has raised nearly $450,000 for scholarships and leadership programs in its 16-year history. Sponsorships are still available, and tickets can be purchased in advance for $50 by contacting the College of Agriculture Office at 530-898-5844 or register online. (opens in new window) The ticket price will rise to $75 at the door. All proceeds go to the CSU, Chico College of Agriculture and the California Agricultural Leadership Foundation. For more information, please contact Sarah DeForest at 530-898-3737 or sdeforest@csuchico.edu.